No gold medal for the start of the WINTER OLYMPICS. NBC: Night 1 (although pre-Opening Ceremony) of the WINTER OLYMPICS had a preliminary 3.4, far lower than the 5.8 preliminary in 2014. Much in television has changed since then, of course, and no doubt we’ll be hearing plenty from NBC about their streaming viewers, but it’s still a bit step down. ABC: GREY’S ANATOMY (2.0) and SCANDAL (1.1) were both down 0.3 from last week, while HOW TO GET AWAY WITH MURDER (0.8) fell 0.2. FOX: The season finale of THE FOUR held last week’s 1.3. 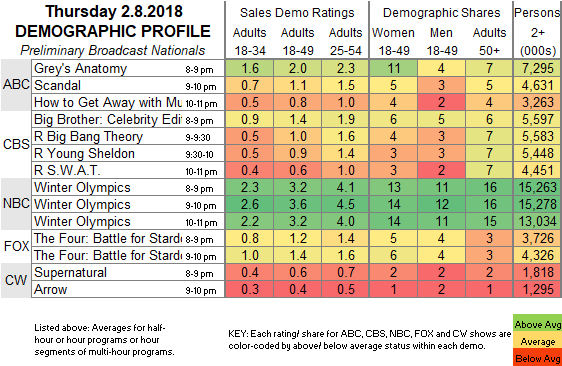 CW: SUPERNATURAL (0.6) and ARROW (0.4) were steady. CBS: BIG BROTHER: CELEBRITY EDITION dropped 0.4 from Wednesday’s premiere to 1.4. 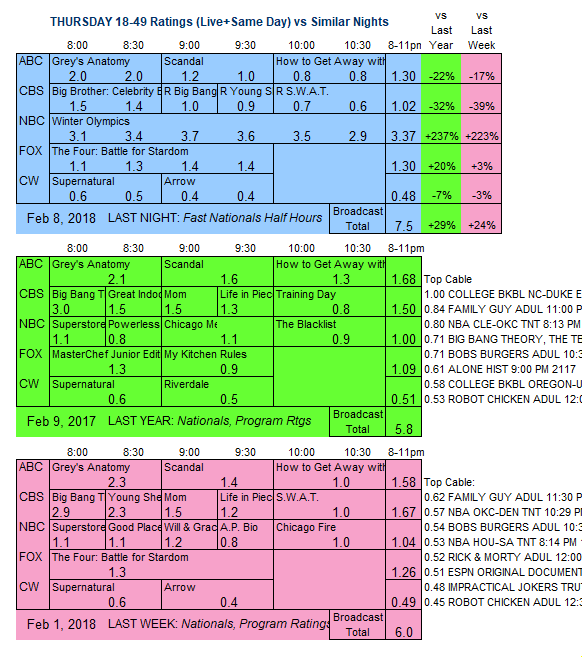 Reruns followed at 0.6-1.0. The WINTER OLYMPICS Opening Ceremony airs tonight, as the other networks fade into a mix of reruns and unscripted programming, which tonight include BE MY VALENTINE, CHARLIE BROWN and CHILD SUPPORT on ABC, WHO SHOT BIGGIE & TUPAC? on FOX, and a 2-hour BIG BROTHR: CELEBRITY EDITION on CBS.